Hi everyone! My name is Scott Larabee. I have been a Wizards of the Coast employee for 20 years, working on Organized Play at the competitive gaming level. I am also on the Commander Rules Committee—the group that shepherds the Commander format so we can all enjoy smashing each other with 100-card decks! I have been on the design team for two previous Commander products: the original Magic: The Gathering—Commander release back in 2011 and Commander (2013 Edition). Martyr's Bond, Hornet Queen, and Toxic Deluge are some of my designs from those products, and I am particularly proud of them. So, for better or worse, Wizards R&D again asked me if I would join the design team for Commander (2018 Edition). Joining a team with Gavin Verhey, Eli Shiffrin, and Jules Robins was going to be a party! When I play Commander, my favorite strategy is building up a quick defense so that I can play around with interesting (to me) combos and mechanics. I have always enjoyed "pillow-fort" or "prison" style strategies. For instance, My Brion Stoutarm deck tries to set up a quick defense so I have time to fling monsters at my opponents with Brion (hopefully, occasionally taking out the table in a single turn). I also love enchantments. When I built my first Commander deck back in 2005 (a Teneb, the Harvester graveyard recursion build), I loaded it up with 15–20 enchantments. One of the things I noticed about Commander (back in those days, at least) was that most players played very little enchantment removal. I took advantage of this and loaded my deck up with Debtors' Knell, Oversold Cemetery, and the like. Enchantments are always the first cards I look at when a new set is released. When I joined the Commander (2018 Edition) design team, I quickly chose the green-white-blue (Bant) enchantments deck. It is a pillow-fort-style deck that is built around enchantments! I can jam even more enchantments into a deck! The thing that was quite different (at least for me) was that the deck would contain quite a few Auras as part of the build. While I play with quite a few enchantments in my decks, I've never really messed around with Auras to a great degree. 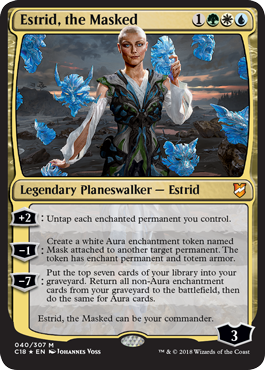 What better card to do the heavy lifting in this deck than the planeswalker commander—Estrid, the Masked! We had knocked around other ideas for the planeswalker commander for this deck, but they really didn't mesh with the deck. It was not based around enchantments and lent itself more to the pillow-fort structure of the deck. We finally started over with a completely enchantment-based Planeswalker. The first ability allows for untapping big enchanted creatures after they attack or helps with mana production on lands enchanted with Auras, such as Dawn's Reflection and Fertile Ground. The second ability is so good in this deck. Adding a Mask token to an awesome land (Serra's Sanctum?) on one turn and using the first ability on that land next turn is a terrific way to ramp up. I did some research on Aura-based enchantment decks when I started on design, and one of their big weaknesses is the ability to recover from removal and board wipes. Being able to add totem armor tokens on often fragile stacks of "creature plus multiple Auras" helps with the deck's ability to recover. Sure, you lose the Auras, but at least you keep the creature around to start the build up again. If only there was a way to get those Auras back . . . Enter the ultimate! Coming up with the ultimate ability for Estrid was easy. What better ultimate for an enchantment-based planeswalker than Replenish? A Replenish where you also get to load up your graveyard with even more enchantments before you put them all back into play. Magical! Each of the decks also has a companion spell for each of the planeswalkers. In this deck, we knew we wanted an enchantment. We played around with a few ideas, but I had the answer. And the answer came from seven years earlier. As Vesuvan Xerox Machine enters the battlefield, you may choose another enchantment on the battlefield. If you do, it becomes a copy of that enchantment and gains "At the beginning of your upkeep, you may pay 1U to have this enchantment become a copy of another enchantment. If you do, this enchantment gains this ability." This card is exactly what every enchantment mage needs when brewing up a deck. It lets you have a second copy of the best enchantment you have in play and change the copy if you get a better enchantment later. 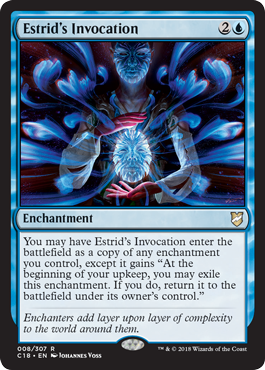 The deck is very hungry for cards, so using Estrid's Invocation on Eidolon of Blossoms, Flight of Fancy, and Sage's Reverie can really help you refill your hand. Yesterday, Gavin talked about the how the entire Commander Rules Committee was involved in this product from the start of design. R&D is committed to keeping the committee involved with Commander products. The committee did a couple of feedback loops on the new cards and was solicited for design ideas that they felt were lacking in Commander. I was particularly pleased by the result when the other members of the committee were able to play with the decks prior to the end of final design. It provided validation that the themes were in a good spot and we were able to address a few concerns the committee had with some of the new card designs. I hope that the committee can do this again in the future. I had a fabulous time being on the design team for Commander (2018 Edition). I hope you enjoy playing the decks as much as we enjoyed making them. May your evenings and battles be enchanted!